This release changes the whole look of the code behind the scenes. It has been beta-tested, but bugs always come up. In case this release critically breaks some functionality, please downgrade to the previous version and log a bug on the support forum. You can download the old version, then replace the contents of your wp-content/themes/suffusion folder with the unzipped suffusion folder that you get from the downloaded file. One of the 2 biggest changes this release is a nice looking backend. For this I moved to the Settings API that WordPress provides. This was a huge and high impact change, because I had to decommission a tried and tested options engine in favour of something that has not been implemented by anyone on such a large scale. All uses of the Settings API on the web are for simple cases where you require only one options page. Anything more complex makes developers pick up a custom approach, or an approach that only superficially uses the Settings API. I can thump my chest here as the first theme with such a complex back-end to utilize the Settings API in all its glory. The only place where the API is not used is in the Custom Types section, which only partly uses the API. I will port it over in a subsequent release – for now it is not critical. This is the second big change, and potentially more high impact than the first. TimThumb, though popular has some security holes, particularly with its old versions. Recently the WP review team started cracking down on themes relying solely on TimThumb. I introduced TimThumb into the mix more than a year back, but I had also introduced support for the native post thumbnail functionality of WP almost as soon as it was introduced. This helped me avoid the axe. With this release Suffusion bids adieu to TimThumb. I have put together a resizing algorithm based on a method suggested by a contributor on WordPress Trac. I had to modify it a good bit to make it work the way I wanted and so that it did not break how your existing images looked. Again, the WP review team has been cracking its whip to get file open operations removed. As a result I have had to think out of the box to make code behave to my liking. I have had to replace inbuilt CURL calls with the WP HTTP API, and where this really posed a challenge was regarding storing of the generated CSS and storing the resized file for the image resizing. Function names are now more consistent. All functions within Suffusion are either prefixed with suffusion or suf. Trust me – I did not want to do this. Suffusion started out with one link under the Appearance section of the admin page. I then pulled it out to give Suffusion its own menu when I introduced Custom Post Type support. I initially had horizontal tabs at the top and vertical tabs within each page, but I switched it out when the page got sluggish. Theme Skinning – Earlier you had a tab called Theme Skinning under Visual Effects. Theme Skinning is now a section of its own and deals almost explicitly with setting up the colors of various components (aka “skinning”). All former individual sub-sections under the old Theme Skinning are now tabs under the new Theme Skinning. For example you have Body Background, Main Wrapper etc. The main purpose of this split was to avoid Suhosin-related issues. You can click on the “Notes” button near the section title as shown above for more information. Visual Effects Other Graphical Elements – This has mostly the remainder of the items of the former Visual Effects section. In addition it has picked up items from the former Blog Features that dealt with graphical aspects, like Featured Content, Post and Page Bylines, layout options etc. You can click on the “Notes” button near the section title as shown above for more information. Sidebars and Widgets Sidebar Configuration – This is the same as the former Sidebars and Widgets section, except for the fact that the Static Tabbed Sidebar has been moved from the former Blog Features page to here. Blog Features Back-end Settings – This is a heavily stripped down version of the former Blog Features. Most of the older options have moved to Other Graphical Elements. You can click on the “Notes” button near the section title as shown above for more information. Templates – This is the same as the old versions. Custom Types – This is the same as the old versions. Translations are no longer a part of the core theme. They have all been moved to the translations page. 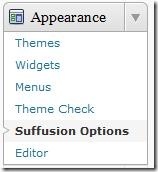 Additionally, at no impact to you the translation text domain has changed from “suf_theme” to “suffusion”. Some changes were required to the default settings to make it pass the review process, and some others were needed for ease of use. JQuery Masonry is switched off by default instead of being switched on. By default both navigation menus are switched off. This was one change I did not want to make, however I did so to avoid a lengthy back and forth exchange. Made the blog title use h1/h2 tags instead of div tags. I have renamed the classes category-info and tag-info to info-category and info-tag respectively. This is to avoid weird styling issues if you have a category or a tag named info. Please make note of this if you have used Custom Styles for these elements. For those familiar with lore, Marvin the Paranoid Android used to reassure you not to panic. Unfortunately, since the photo of Marvin was not GPL’ed, I had to remove him from the introductory screen (though I had provided the appropriate credits to Buena Vista). There is a new capability to control the number of sidebars on different views like the blog, category, tag, date archive and search. For example you can now have 2 sidebars across your site, but only one sidebar on the blog page. Check the settings under Sidebar Configuration → Sidebar Layout. All in all the ability to manage sidebars for specific pages/views has improved from previous versions, and in the next release or two you should have something very flexible. I might write up an article on how to effectively tweak sidebars shortly – let’s see. You can now upload an image directly from the options pages instead of entering a URL. Of course, entering a URL works too. New versions – Tells you when a new version is available and points you to the release notes. The reason for this is that some people complained about frequent updates (though old-timers will note that I have significantly slowed down) – this is for them to check out what the latest version has, so that they can make an informed decision about upgrading. Translations – If you are using WP in a language other than Americanized English, you are pointed to the right locations to pick up the correct translations. BuddyPress – If you are using BP, this provides you information about making Suffusion work with it. Added options to control the “Posted By” format. See Other Graphical Elements → Post and Page Bylines for more information. Added better WPML integration. There are texts that you set in the back-end, like the labels for your comment forms etc. I have added WPML support for them, so that you can translate those strings in the back-end. Added zoom-crop capability (aka proportional resizing) for images in featured content, magazine headlines and magazine excerpts. See the respective sections for setup options. There is dual JQuery UI support, for version 1.7.3 (WP 3.0.x) and 1.8.7 (WP 3.1.x). You can now control the number of headlines you want to display in the headlines section of the Magazine template. 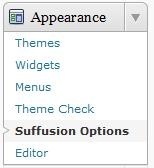 There are a couple of new filters: suffusion_author_information and suffusion_category_information. They can be used by you to tweak the information that appears at the top of the Author page and the Category pages. There is a new option to force compatibility mode in IE8. You will find the option in Back-end Settings → SEO / Meta Settings. There are a couple of options more dealing with the generated CSS. You can choose to cache the generated CSS, include it directly in the HTML, include it via a link etc. There was a bug earlier that was causing the title set through Suffusion’s SEO to clash with the title set by different SEO plugins. This should now be fine. In the Magazine template if you were displaying headlines, the first headline was not being selected by default. This has now been fixed. The $post variable was getting overwritten if the Ad Hoc Widgets were used to display things like featured posts or category blocks. I have fixed a bug where if you looked at a page in BP you would see an incorrect HTML title. I have included what is hopefully a patch for a WP problem (not a Suffusion problem) affecting a very small percentage of users. With the bug kicking in, users were unable to reliably see the child pages for a given page in the breadcrumb because WP fails to provide the ancestry relationships properly. I have also included a patch for a NEXTGen Gallery bug. I have often expressed my dislike for this plugin thanks to a variety of reasons. In this case including the fix at my end seems to be a much easier thing to do than wait for the NGG guys to put it in. The fix deals with viewing NGG, when used with themes employing max-width and min-width on IE8 without compatibility mode. I have decided that I will periodically do a review of redundant options in the theme and cull them. Options that have much better plugin-based alternatives and options that have significant maintenance overhead will be removed. Compression options for JS, CSS and the site as a whole have been removed. Sorry, but those serve very limited functionality and are incapable of generating compressed content for files from external plugins. If you are looking to do any of these, you can try using W3 Total Cache or some similar plugin. The only compression-specific option introduced is to minify the generated CSS into 1 line, so that you don’t add hundreds of lines into your source code – just one long line will be present. Removed the option to load JQuery via CDN. This was becoming extremely ungainly. If you want to use CDN versions, please use a plugin. I do understand that this is a pretty big release. So if you have upgraded and something has broken badly, please do not hesitate to downgrade (and report the problem on the Support Forum). This isn’t meant to alarm you, for most code-related issues can be fixed and I have taken a lot of care to keep the code good. This is just to assuage your concerns that if something goes wrong, it makes best sense to follow the advice on the introductory page of the options: Don’t Panic. Thank you, Sayontan! Your efforts are greatly appreciated. that’s some BIG changes ! hopefully it will not interfere with my custom settings. I hope not. However, a few people have reported some errors (not everybody, mind you). So just wait for a day more – I should have a patch out. I did seem to loose all my settings… or at least a bunch, related to the magazine template and the nav menus, but no big deal. I just wanted to say thank you for all the work that you do for us. I love this theme and I have never found another I like even half as much. I understand that you put in a great deal of work to make sure we have updates and fixes and new options. I appreciate it so much. Thank you for everything. Most Important: ->1. The back end Suffusion setting did not open after repeated clicks. I refrshd the page cache too. 3. When selected the Magazine Page the Featured Content did not display the Images. … Any assistance from me I am willing to help. Not sure what you mean in #2. Thanks a ton for your quick reply. I found that wordpress was giving me the option for 3.7.5 and then as you pointed out i installd 3.7.7 and all worked well. My WordPress installation offers me Suffusion Version 3.7.7, any mistake in your versioning system? Thank you so much for the support and excellent theme. I like it more each time I tweak it up a bit. Coffee coming your way! Thank you again. I just want to be sure before I upgrade: if something doesn’t work as it should, I can downgrade and everything will go back to exactly the way it was before? I love this theme and my website looks so much better with it than it did before. So I am really scared to play around too much now that I have got it looking so good! Here is what I would suggest – go to Introduction → Export / Import, then export your settings. Save them in a location outside your WP folders. Do the upgrade, and if something looks wonky, go to Introduction → Export / Import again, then import your settings using the file you exported. If you still feel there are errors, feel free to downgrade – your exported settings act as a good backup. Thank you for your response. I am still nervous about upgrading though! If there are errors and I downgrade, can I use the method you mention to get everything back exactly the way it was? Unless I can know for sure that everything would stay exactly the way it is now (as regards to how the website looks) I think I’ll just stick with the version I currently use! Hi, I just upgraded and my sidebar 1 (bottom) container vanished: http://www.viverecapetown.com. In there I have the widget pages and another text widget (for Facebook likes). Before the upgrade sidebar 1 had the option of “flatten the sidebar” and sidebar 1 bottom “show widgets in individual areas”. I am a Suffusion user some 13 months with many inquiries about your beautiful theme. Thank You for your continued efforts. A lot of the bug reports came up as false alarms with no theme patching required. Most users had no issues with the new resizing features. The only impact that dropping TimThumb will have had is the inability to up-size images. Maybe there are a couple more impacts related to cropping, but they should be really minor. I have just had my sites hacked by a serious hole in TimThumb. It has taken me all day to remove it. I’ve updated all my sites to the latest Suffusion. Is that enough, or do I need to delete some timthumb files? I honestly cannot say, because this depends on how well you have done your cleanup. Note that inactive themes or plugins with an accessible TimThumb script still put your server at risk. It is a pity you waited to get hacked before updating, though – the TimThumb-free version of Suffusion has existed for about 6 months now.